Recently, we had some time to sit down with Travis Anderson, the art director for Mysthea. We think he did an awesome job bringing the world and myths of Icaion to life. You can read the full interview below. Question 1: What made you decide to become an illustrator? When did you first start, what did your first projects look like? How did these develop into what you do now? I actually am more of a jack of all trades when it comes to art production. I'm still trying to find my place in the world. I have graduated and been formally trained in 3D modelling/animation and self taught in painting, design and concept art. I also have experience in UI design and graphic novels. I love everything that has to do with building, creating and telling stories. I didn't always want to be an artist even though I started quite young. In fact up until grade 2 I wanted to be a volcanologist. It was when I started writing little stories in a tiny book with pictures about adventures I imagined that I began changing my focus. My first "project" was when I was in middle school and I wrote and illustrated a 100 page graphic novel about a prince and a princess trying to escape an army of living shadows and I've been doing projects like that ever since. In high school I was making an animated short film every year. In university I was working on a graphic novel for an author named Joel Mark Harris while developing more short films, creating concept art for a therapy video game and working on my grad film, which was in 3D. Then, when I finally graduated I embraced freelance opportunities. Some of the multiple companies I’ve worked with are: Bushiroad who does trading card games, Metanaut who does VR game development, UBC where I supply modelling expertise to a tech research group called the "Emerging Media Lab" and Tabula Games where I got the great opportunity to be art lead on the new Mysthea project. Question 2: Could you describe your personal style/tell us what inspires your work? I think I have yet to nail down my style but I know that I love saturated colour and messy fiddly detail way too much for my own good. I grew up with the artist James Gurney and his Dinotopia books. I adored how he built this world in his books that felt so real but were so fantastical at the same time. Then as I grew older I found a pattern in the media I gravitated towards. If the story was about exploring lost worlds I would be instantly hooked. The Pendragon book series in middle school is an excellent example of that trend and when I was 14 I was enraptured by the art of James Cameron's Avatar which again was about exploring a detailed alien world. The opportunity to experiment and explore when building a world in a story is addictive, the process involves taking what I have learned about the design of the natural world and mix and match with other inspirations. It’s this remixing that I find so enjoyable as it sometimes comes out with unexpected results. 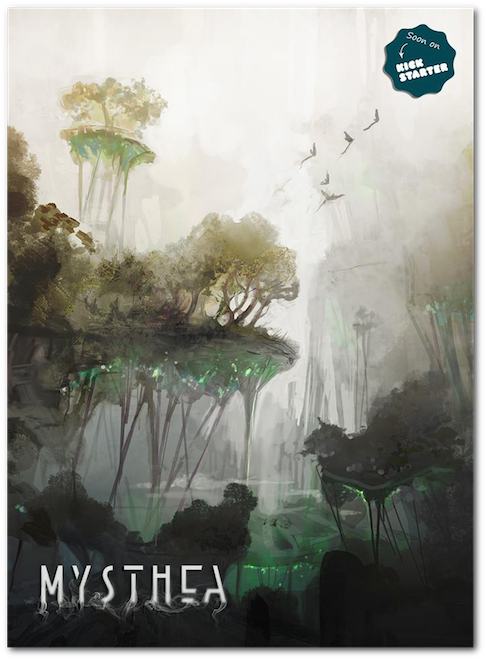 Question 3: What were your first thoughts when you were presented with the idea for Mysthea? I was ecstatic when I got approached by Tabula Games. The elements of mist, floating islands, mystery, ancient crystals, monsters and exploring tribes was right up my alley and my first experience professionally leading the direction of a project. My first thoughts were questions: Who were the tribes? Why was there this mist? What connection does the crystals have to the monsters and the mist? Is there a conspiracy hidden here? From there I went about exploring. Question 4: Why did you accept to work on the project? I accepted the work due to how much freedom I was given with exploration. A lot of my freelance work is locked down tight by client description but this project was wide wide open. This is very rare in my industry experience so far and I jumped at the chance. Question 5: Tell us what you think about the final results of the world of Mysthea. Mysthea is a frightening but beautiful world, I certainly wouldn't last long myself if I lived there but if I did I would be sticking close to the cities perhaps like in real life making my way into the wild and the mist every so often to sketch. I look forward to exploring more when the time comes and I can't wait to see how the game comes together and try playing it. Hopefully a lot of other people too will enjoy it and be fascinated with what I created/ discovered art wise. 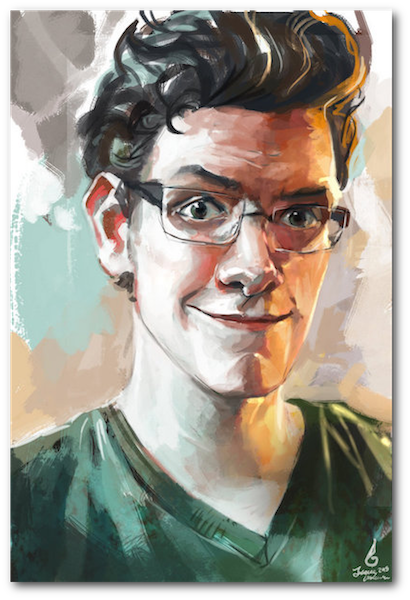 Below, you can find out more about Travis and see some of his other amazing works!